After reading The E-Myth Revisited by Michael Gerber and The 80/20 Principle by Richard Koch, I decided that extreme questions were the forcing function I needed. I don’t really have some sort of Top10 of my books but I enjoy reading things my friends read and also things from people I get inspired by. But, to choose something, a very interesting business book is the E-Myth by Michael E Gerber. I've been reading that while I was working out of my kitchen. It was learning how to delegate and learning that you cannot be the technician if you want to run this company. So, after reading that book, I was making maybe three grand a month, so not a lot. [...] I realized, wow, that was such a big help, to have an assistant and to learn how to manage her and delegate tasks. Without that book, I probably would have tried to do everything on my own. That's a great book to start out. As a marketing & strategy addict, I'll go beside all the books mentioned above with Outliers by Malcolm Gladwell, Buy-In: Saving Your Good Idea from Getting Shot Down by John P. Kotter and Lorne A. Whitehead, The E-Myth: Why Most Small Businesses Don't Work and What to Do About It by Michael E. Gerber. This book is a great read for anybody interested in getting into business, because it lays out in a very practical and clear fashion what to do and what not to do in order to make your business predictable and repeatable. 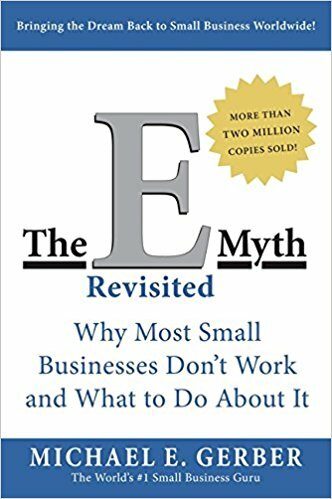 The E-Myth, because it explains clearly how to start a business the right way. It pointed past being a solo entrepreneur to building a team and a company that can run without me. Just a simple read, straight forward advice about running a business. It helped clear up any overwhelm I was feeling when thinking about everything that needed to be done. “The E-Myth” was big for me in my early days by Michael Gerber because it showed me how you can build a business that runs without you. That was one my main important criteria back then and still today, really – it was to find a way not just to create a business that’s a job, I didn’t want a job in the first place. I didn’t want a business that would become a job either, so I needed to make sure I’d build something that would ultimately function (at least) almost completely without me or as close as I could get to it. So, “The E-Myth” really helped ram home those kind of ideas. So around 10 years ago I stumbled into starting a small digital design agency with John Goleby who I met at school. We both dropped out to pursue this business which quickly became all consuming. I think at around the 2-3 year mark we were dealing with all the typical small business problems like growth and staff when I came across this book. Reading it for the first time many of the points brought up by Michael Gerber hit so close to home I was left wondering if somehow he'd written the book just for me. It completely changed the way I thought about my own role in the business, and how to set up the business in a way that could grow sustainably. In The E-Myth Revisited, I remember this distinct realization that I'd built myself another job, not a business. That book got me really excited about creating systems and processes in place and delegating as much work as I could. Letting go wasn't an overnight thing, and it's something I still struggle with, but the message of working ON the business instead of IN it was something I was able to run with right away. The first time I read Michael Gerber's The E-Myth Revisited, I was just starting my first company and it opened my eyes to the difference to between working IN your company and working ON your company. I realized that I needed to strategize all of my decisions in my business to support me not being the cog in the middle of it, but to be sure it could function well without me. The book that’s had the biggest impact on me is The E-Myth by Michael Gerber (I even wrote about it in my own book). I read it front to back, then reread it right away. Gerber takes you through every step of a running a business from start to finish, and shows you what you need to make it successful. I read it when I was looking to take 1-800-GOT-JUNK? to the next level, and I had an epiphany: people don’t fail, systems do. Reading his book got me to take a good, hard look at my business and focus on developing our systems and hiring happy people. His book is one of the reasons we were able to sell out of 1-800-GOT-JUNK? franchises and scale that success into three other home-service companies, WOW 1 DAY PAINTING, You Move Me, and Shack Shine under the O2E Brands banner.